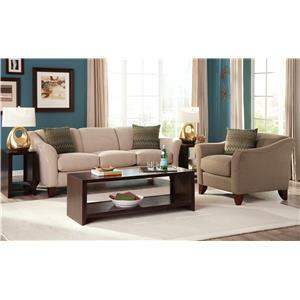 The 2675 Stationary Living Room Group by Craftmaster at Fashion Furniture in the Fresno, Madera area. Product availability may vary. Contact us for the most current availability on this product. Leg or Skirt Wood legs are built into frame for strength and durability. Fully lined tailored skirts. Arm Type The beautiful rolled arms have nail head detailing. 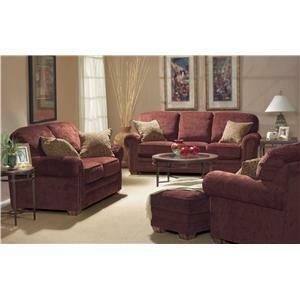 This cozy upholstery collection features curved backs and beautiful rolled arms with nail head detailing. Exquisite, exposed wood bun feet and brass nailheads (available in two sizes and colors) adorn this sophisticated and traditional look. Accent pillows in contrasting colors highlight the natural beauty of this sofa, love seat, ottoman and chair. Bring this collection into your home for a relaxing, comfortable feel. Perfect for any fine living room, family room, or entertainment room. The 2675 collection is a great option if you are looking for Traditional furniture in the Fresno, Madera area. 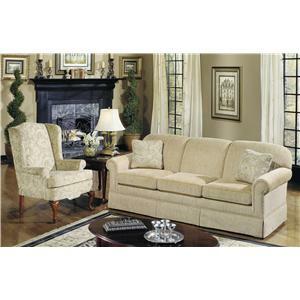 Browse other items in the 2675 collection from Fashion Furniture in the Fresno, Madera area.